Nothing embodies the spirit of freediving and spearfishing more than Maori Pendants designed by the ancient Maori people of New Zealand. Wearing these pendants shows a sign of respect for the ocean and all that inhabit our waters. This ancient Maori Pendant design is also regarded as a good luck charm as it provides safety and protection while traveling over water. The pendent is also a sign of respect and deep friendship when given to a friend, both male and female. 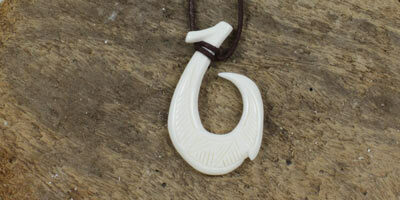 Made of genuine Ox bone with MAKO logo on one side. Lightweight and nicely carved, this makes a really cute gift! I colored in the pendant with a Sharpie marker and rubbed off the slop. It looks pretty awesome. I like it! I've been really happy with all of the products that I get from Mako. They always arrive fast and are good quality. I was a little bummed that the shipping was almost as much as the item, but so it goes. Good to have trinkets of our sport to show off.